ADAH- Enlisted Company G 08/15/1862, DaleCounty, Alabama, Age 34, Married, Farmer. He participated in battles at Fredricksburg, VA12/13/1862 through Suffolk, VA05/13/1863. Absent sick Gettysburg, PA07/02/1863through 07/03/1863. Absent furlough Chicamagua, GA09/19/1863to Dandridge, TN 01/16/1864inclusive. Absent under arrest Wilderness, VA 05/06/1864to ChesterStation, 06/17/1864inclusive. Present Deep Bottom, VA 08/14/1864. Severely wounded Fussels Mills, VA08/16/1864. Absent wounded Ft Gilmer, VA 09/27/1864to Darbytown 10/07/1864inclusive. Absent furlough DarbytownRd, VA10/13/1864through DarbytownRd, VA10/27/1864. Absent wounded WilliamsburgRd, VA10/27/1864. POEcho, AL. NARA- He was admitted toGeneralHospital#9Richmond,VAthen transferred toChimborazoHospital#4Richmond,VAwith chronic diarrhea from05/13/1863to06/18/1863then transferred to CSA General Hospital Danville, VA06/13/1863then furloughed07/23/1863. Wounded08/16/1864 with a severe chest wound and admitted toGeneralHospital, Howard’s Grove, Richmond,VAon08/18/1864then furloughed 60 days on09/15/1864to return to DaleCounty,AL. OATES- Gillum Riley was 34 years old when enlisted 08/15/1862. He was mustered as “absent sick” a good part of the time; was severely wounded on the Darbytown Rd near Fussel’s Mills 08/16/1864. He never returned to duty. ADAH- Enlisted Company G 08/15/1862, Dale County, AL, Age 22, Married, Farmer. He was absent furlough Fredrickburg, VA 12/13/1862; Present Suffolk, VA 05/03/1863 to Dandridge, TN 01/16/1864 inclusive, Absent under arrest Wilderness, VA 05/06/1864 to Chester Station 06/17/1864 inclusive; Present Deep Bottom 08/14/1864 to Williamsburg Rd, VA 10/27/1864 inclusive. PO Echo, AL. NARA- 01/20/1865 Deserted from company.01/20/1865Register of Oaths taken by rebel deserters, headquarters Provost Marshall Bermuda Hundred, VA- captured at headquarters Army of Potomac, turned over to Provost Marshall City Pointe, VA;01/24/1864sent from B Hundred, VA toWashingtonand took oath.01/26/1865Sent from headquarters Army of Potomac- transfer furnished to Jacksonville,FL. OATES- John Riley was 23 years old when enlisted08/15/1862. He was a very fair soldier until the close of the year 1864. In Feb, 1865, he tired of the war and deserted. ADAH- Enlisted Company G08/15/1862,DaleCounty,AL, Age 20, Married, Farmer. He was absent furlough Fredrickburg, VA 12/13/1862. PresentSuffolk, VA05/03/1863and died of disease atLynchburg,VAon06/16/1863. POEcho, AL. NARA- He was admitted to WinderHospitalon 10/28/1862and furloughed for 20 days 12/06/1862; Admitted to 2nd Alabama Hospital Richmond, VA 12/20/1862, thenGeneralHospital #1Danville,VA on06/13/1863 and died 06/18/1863 of Typhoid Fever at Pratt Hospital Lynchburg, VA.
OATES- George Riley was 20 years old when he enlisted 08/15/1862. He rendered but little service, and died of disease at Lynchburg, VAJune 1863. I certify that the within named Edward Riley a Private of Capt. W.C. Oates Company “G” of the 15th Alabama Volunteers born in Dale County State of Alabama aged 21 years. Six feet high, light complexion, blue eyes, light hair, and by occupation farmer was enlisted by J.R. Breare in Dale County Alabama on the 15th day of August 1862 to serve for the war. He died on his way to Hospital on the 20th day of November 1862. The said Private Edward Riley Jr. was never paid anything for his services. There is due him pay as a Private from August 15th 1862 of his enlistment to the 20th day of November 1862, the day of his death. Three months and five days at $11.00 for month. There is due him for clothing not drawn in kind. There is nothing due him for bounty. He owes the Confederate States nothing. I certify that the above is a correct transcript from the record of my company “G” 15th Alabama Regt. OATES- Edward Riley was 19 years old when he enlisted08/15/1862, and died of disease10/20/1862. ADAH- Enlisted Company G08/15/1862,DaleCounty,AL, Age 28, Married, Farmer. PresentFrederickburg,VAthroughSuffolk,VA 05/03/1863; Severely wounded atGettysburg,PA07/03/1863to Dandridge,TN06/16/1864inclusive, Absent without leave Wilderness, VA05/06/1864toWilliamsburgRd,VA10/27/1864inclusive. Deserted.POEcho, AL. NARA- Hospitalrecords: CSA General Hospital Charlottesville, VA01/08/1863“Debititus” and without regular discharge in transit to regiment stopped for one night; returned to duty01/09/1863. Hospital #1Lynchburg,VAadmitted04/07/1863, “Rheumatitis”.CSA GeneralHospital,Charlottesville,VAadmitted07/12/1863gunshot wound; furloughed08/10/1863. OATES- Daniel Riley was 28 years old when enlisted08/15/1862. He served well until severely wounded at the battle ofGettysburg. He recovered, but never returned to the company and deserted in 1864. He was several years ago elected tax collector by the Republicans of Dale County. ADAH- Enlisted Company G08/15/1862,DaleCounty,AL, Age 30, Married, Farmer. Absent sick atFredericksburg,VA12/13/1862, Died of disease Richmond,VA01/03/1863.POEcho, AL. OATES- Samuel Riley was 30 years old when enlisted08/15/1862, and died of disease atRichmond,VA06/03/1863. ADAH- Enlisted Company G08/15/1862,DaleCounty,AL, Age 26, Married, Farmer. Present atFredericksburg,VA12/13/1862toDandridge,TN01/16/1864inclusive; Captured: Wilderness, VA05/06/1864; Absent capturedSpottsylvania, VA05/08/1864toWilliamsburgRd,VA10/27/1864inclusive. Still a prisoner. POGoline,AL. NARA- Prisoner of War at Elmira, NY. Captured Shotts Courthouse, Wilderness, VA 05/06/1864; Joined station 08/17/1864, Remarks: Was conscripted 07/15/1862desires to join the 1st Regiment US Army. Died06/04/1865 of chronic diarrhea. OATES- John A Woodham was 26 years old when enlisted08/16/1862. He was a good soldier and fought well, but was captured at the Wilderness05/06/1864 and was held a prisoner of war until he died, the date of which is unclear. ADAH- Enlisted Company E on03/03/1862,Westville,AL, Age 28, Married, Farmer. Present at Winchester, VA 05/25/1862, Cross Keys 06/08/1862, Cold Harbor 06/27/1862, Malvern Hill 07/02/1862, Cedar Mtn 08/09/1892, Hazel River 08/23/1862, Monnassas Junction 08/27/1862, Harpers Ferry 09/13/1862; Severely wounded: Sharpsburg, VA 09/17/1862; Absent Wounded Fredericksburg, VA 12/13/1862, Suffolk, VA 05/03/1862, Shepherdstown, VA 09/19/1862, Gettysburg, PA 07/02/1862. Absent Furlough:Gettysburg,PA 07/03/1863to Wilderness, VA05/06/1864; Absent Sick:Spottsylvania,VA 05/08/1864, Cold Harbor06/03/1864,ChesterStation06/17/1864. Captured Sick at Spottsylvania05/15/1864. Paroled about11/01/1864.PONewton,AL. NARA- Roll of Prisoners of War at Point Lookout, MD, Date of arrival on 05/22/1864 captured Fredericksburg on 05/22/1864 then paroled and transferred to Aikins Landing, VA 09/18/1864 for exchange where captured Hanover Junction 05/14/1864. Hospital records- CSA General Hospital Charlottesville, gunshot wound, admitted11/29/1862transferred toLynchburg. Floyd House Ocmulgee Hospitals,Macon,GA01/15/1864- returned to duty.CSA Charlottesville GeneralHospital,Charlottesville,VA05/02/1864, gunshot left foot, transferred05/03/1864toLynchburgto Ward A05/31/1864. Genera Hospital, Howard Grove,Richmond,VAadmitted09/22/1864, furloughed 40 days09/28/1864. OATES- Steven M Woodham was 28 years old when enlisted03/03/1862. He was a faithful soldier; Severely wounded atSharpsburg,MD09/17/1862. He returned to duty as soon as able, and being quite sick was captured at Spottsylvaina Court House, 05/1864. He was paroled 11/1864, but never exchanged. ADAH- Enlisted Company G08/15/1862,DaleCounty,AL, Age 20, Single, Farmer. Present atFredericksburg,VA12/13/1862toChickamanga,GA 09/19/1863inclusive; Severly wounded:Chickamanga,GA09/20/1863; Absent wounded:Lookout Valley,TN10/27/1863toWilliamsburgRd,VA10/27/1864 inclusive. Permanently disabled- lost foot.POGoline,AL. NARA- Hospitalrecords- Medical Examining Board,Dalton,GA11/10/1863 “examination for furloughs” # days- 60, Hospital- Oliver- gunshot wound of leg with amputation of same. OATES- Uriah Woodham was 30 years old when enlisted08/15/1862. He was also a fine soldier, but was severely wounded at Chickamanga and permanently disabled by the loss of one foot, and honorably discharged in consequence. He resided nearNewtoninDaleCounty. OATES- Edward C Woodham was 40 years old when enlisted10/11/1863. He was a conscript, but little service, and finally disappeared. He put his son John in as a recruit, and obtained a thirty days furlough therefore and never returned. ADAH- Enlisted08/16/1864,DaleCounty,AL, Age 16, Single, Farmer. Absent sick: FtGilmer,VA09/27/1864; Absent detail: Ft Harrison, VA09/30/1864; Absent sick: Darbytown 10/07-13/1864; Wounded:DarbytownRd,VA 10/19/1864; Absent wounded:WilliamsburgRd,VA10/27/1864, PO Golene, AL. NARA- Register of Oaths by Rebel Deserters, Headquarters Provost Marshall, B Hundred, VA captured headquarters Army of Potomac 01/22/1865. Register of Prisoners received and disposed of by the Provost Marshall General, Army of the Potomac01/23/1865. Sent toWashingtonDC01/24/1865, took the oath at B Hundred, VA.
OATES- John Woodham, the son, was 18 years old when enlisted08/15/1864. He came in as a recruit for his father Edward C Woodham, and deserted as soon as he learned that his father was at home. The father, it was said, met his son at Pensacola, and they remained within the Union lines until after the surrender. OATES- Larkin Bagwell was 21 years old when enlisted. He was a good soldier and present at every battle except when on detached duty, until at the battle of Chickamanga, in which he was severely wounded09/19/1863, which caused the amputation of one of his legs. He lived inDaleCountyand was a Republican in politics. He succeeded in making a good living by his own labor, not withstanding the loss of his limb. ADAH- Enlisted Company B03/11/1862,Clopton,AL, Age 21. Died in City HospitalVicksburg,MS11/17/1862. Buried in City Memorial Cemetary, Vicksburg,MSGrave #328. NARA- Deceased11/01/1862atVicksburg. Sent to hospital atBardstown,KY10/03/1862by order of surgeon, last heard from inVicksburg,CA11/15/1862. NARA- Enlisted 03/11/1862, Clopton, Dale Co, AL. 3rd Sergeant, Captured near Atlanta 07/22/1864, Received by military prison Louisville, KY 07/29/1864, Discharged 07/30/1864 and sent to Johnson Island, OH, Oath of allegiance Johnson Island dated 06/15/1865. Residence Echo,AL, age 32, dark complexion, dark hair, grey eyes, height 5’8”. PRESTON- Captured and not exchanged. ADAH- Enlisted Company B03/11/1862, Clayton, AL. Muster in roll dated Greenville,AL. NARA- Age 27. Enlisted03/11/1862Clayton, AL. Nov-Dec 1863 muster roll absent. Detailed Provost Guard June 1863 by General Wood, returned since muster roll. ADAH- Enlisted Company B03/11/1862,Clayton,AL, Age 23. NARA- Descriptive list and account of and clothing of Elias Riley, a private of Captain RE Woods Company B 33rd AL Reg was born in Dale County in the state of Alabama aged 24 years 5’10” high, fair complexion, blue eyes, dark hair and by occupation farmer. Was enlisted on the 11th day of March 1862 by HD Clayton at Clopton, AL to serve for 3 years. He died at London, KY on the 16th day of October 1863. The said Elias Riley was last paid by Captain Price up to the 30th day of June 1862 and his wages due him from that date to the date of his death. He owed his bounty and $75.00 commutation money. He is not indebted to the CSA. I certify that the above is a correct transcript from the record of Company B 33rd Alabama key stationed atTullahoma,TN. Dorcas L Riley, wife of Elias, as sent a report from the CSA filed03/19/1863 with an amount found due of $63.86- certificate #18083. ADAH- Enlisted 1862,Clopton,AL, then again in 1863 atSkipperville,AL, Age 21. Was wounded atMurphreesboro,TN,New Home,GAand lost his left arm nearJonesboro,GA.Served until he was paroled at the surrender atGreensboro NCat the close of the war. He was honorably dischared May 1865, and applied Alabama Pension #13441, Henry Co at age 62 on08/04/1904. Address: Newville,AL. NARA- Slightly wounded in hand01/16/1863. ADAH- Enlisted Company B03/11/1862, Clopton,AL.Hospital register #5635, General Hospital Selma complaint: Feb remittens admitted and discharged 11/02/1864, continue and until close of war, discharged Camp Chase, OH and applied for Alabama Pension #33862 Henry County, Address 1907 Newville, AL. NARA- March and April 1863- detained as sharp shooter on04/19/1863by order of Brig. Gen. Wood. CapturedSalisbury,NCon04/12/1865and sent as a prisoner of war toLouisville,KY04/29/1865; Then taken to Camp Chase, OH 05/04/1865. Took oath of allegiance 06/13/1865 showing a place of residence at Dale Co, AL, medium complexion, light hair, grey eyes, height 5’8”, Age 22 years. ADAH- Enlisted Company B03/11/1862,Clopton,AL, Age 20. Died 06/08/1864- List of Alabamians Confederate Burials, Rose Hill Cemetary, Macon,GA. PRESTON- John Riley died 1862. Original page 11. ADAH- Enlisted Company B03/11/1862,Clopton,AL, Age 30. Killed at Perryville. NARA- Captured,Chaplin Hills,KY.Cause of death- wound in arm; died 10/27/1862, Hopsital inPerryville,KY.Lucinda Ward, widow, filed a pension claim02/08/1864with the CSA. One dark night while the Dale Co Grays Company B, the Zolicoffer Advengers Company I, 33rd Alabama Regiment and Company 17th Mississippi Regiment were garrisoning Fr. McRee,Pensacola, FL. There came up a great storm and high tide in March or April 1862 and flooded a low narrow crooked strip of land a mile in length that we had to guard at night from the fort to the mainland. In the latter part of the night a US supply ship lying outside the bar while laboring in the storm threw overboard many barrels of vinegar, cracker boxes, and other things and when they came floating across this neck of sand on which the sentinels were posted they mistook them in the dark and storm for Yankee boats trying to land from Fort Pickens and fired at them. All came to attention in the fort. Took their places and loaded arms. Some of the sentinels in their excitement after firing sit their muzzleloading muskets in the water to reload and the powder got wet and when they attempted to fire at the next object floating across they discovered their mistake. Then they yelled “Corporal of the Guard, Post No. 3, 5, or 9”, as the case might be. A Corporal and relief guard went out. The firing continued. Then Capt. R.E. Ward, being officer of the day, decided to make grand rounds and investigate and took an extra detail of about twenty of us. We made slow progress through the water in the dark with a sentinel, occasionally shooting a buck and ball cartridge dangerously near our direction at a floating object. And in our excitement in the dark, storm and supposed presence of the Yankee a vinegar barrel on the crest of a wave looked as big as a whale boat and we would shoot at it. Day dawned and with it the situation, there were some fifty of us wet and in no joking mood. ADAH- Enlisted Company B03/11/1862,Clayton,AL, Age 27. Argee Pearce, widow,Abbeville,ALclaim filed11/23/1862. ADAH- Enlisted Company B03/11/1861,DaleCounty, AL. Wounded at Perryville,KY.AlabamaPension #11692DaleCounty. NARA-Enlisted 03/11/1862Clopton, Dale Co, AL, Age 24. Wounded Battle Perryville, KY10/05. Sent to hospital by order of surgeon. Released from 3rd Sergeant to ranks on 01/21. Detailed as nurse in hospital04/19/1863 by order of General Bragg #103. Now home sick on furlough. Register of Prisoners of War. Exchanged12/01/1862 and received on board the steamer Metropolitan near Vicksburg,MS. ADAH- Sergeant.09/18/1863, At Chickamanga, TN was wounded in the right hip. NARA- Enlisted03/11/1862, Clopton, Dale Co, AL, 3 years for the war. NARA- Enlisted for 3 years, received no pay or bounty; joined by enlistment. NARA- Enlisted03/11/1862BrandonsStore. Sent to hospital04/22/1963by order of surgeon. Surgeon recommendation for discharge- Enterprise Hospital, 39 years- unable to discharge duties of a soldier by reason of chronic rheumatism of the hip joint. Unable to do duty for 2 months. Unfit for service. State of Florida, CalhounCounty. On this the 4th day of April 1904 personally appeared before me are Hardy M Maund who enlisted on the 15th day of April 1863 in Captain Milligans company, Dale Co, AL and while in actual service in said company 57th Alabama Regiment of the State of Alabama and in line of duty as such soldier at Newton, State of Alabama, on 15th day of April 1865 and honorably discharged. He was wounded atFranklin,TN on 30 day of November 1864 by a shell exploding at his side, causing partial paralysis of the left side. I was sent to hospital atColumbia,TN when command fell back. I was finally sent to hospital atMontgomery,AL when I was sent home on sick furlough which was extended from time to time till close of the war. ADAH- Enlisted Company E. Pension application Dale Co,AL04/22/1887. Applicant- Mrs Juda Riley. Scotts Brigade. NARA- Register of sick and wounded Confederate Soldiers at Post Hospital, Augusta, GA. Complaint- pneumonia, admitted 05/11/1865, returned to duty 06/16/1865. Thomas Ward (1845-1920), son of Mary, daughter of John Jr.
ADAH- Enlisted Company D02/11/1863at Troy, Pike Co, AL. Born- Dale Co, AL. Paroled atGreensboro,NC, discharged 1865. Address 1907/1908 Ozark,AL. NARA- Enlisted03/16/1863,Clopton,ALby Captain WC Bethune for 3 years. List of prisoners of war surrendered to Brig Gen EM McCook by May Gen Sam Jones CSA atTallahassee,FL05/10/1865. ParoledAlbany,GA05/24/1865. 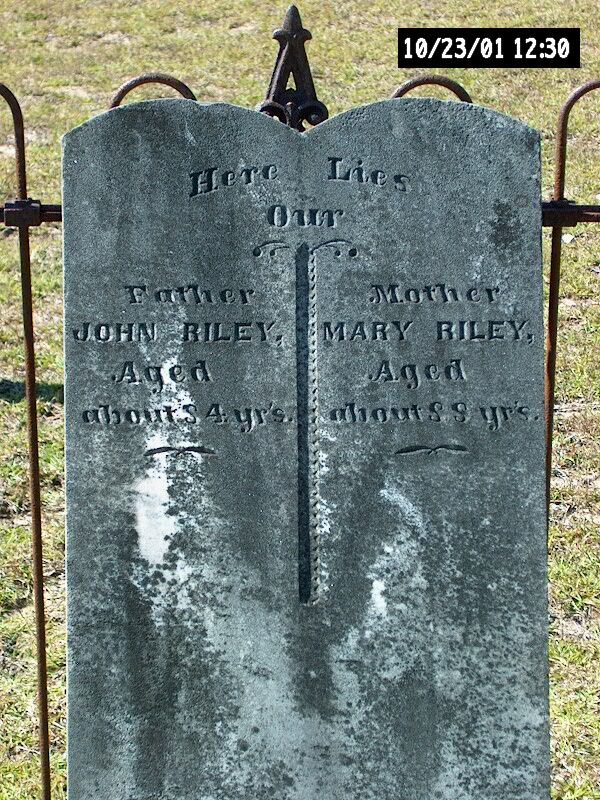 Abraham Riley (1803-1865), son of John Sr.
ADAH- Enlisted Company F, Dale Co, AL, Age 55. Discharged: 08/08/1861 Master in Roll,CampHardee08/31/1861. NARA- Company ,muster in roll dated05/07/1861, Pike Battery, muster in 04/15/1861, enrolled04/13/1861at Barnes Crossroads, AL for 12 months. Present and sick. Discharged08/08/1861Special Order 59 Headquarters Troops CSAla Pensacola, FL. Discharged and final statement given. ADAH- Enlisted Private Company A04/14/1864,Abbeville,AL, Age 32. Muster in rollAuburn,AL05/13/1862. NARA- Report killed, wounded, and missing of the first division, Army of the West in the Battle of Corinth, MS 10/03 to 05/1862. Report dated10/13/1862- Wounded. List- Killed or Wounded,Moore’s Brigade during the siege of Vicksburg, MS 05/17- 07/04/1863. List datedEnterprise,MS09/18/1863 Remarks: Killed. Charity Riley, widow, filed a claim for settlement with the CSA on02/16/1864. ADAH- Enlisted Private Company A03/22/1862, Age 35,Auburn, AL. Captured Vicksburg, MS07/04/1863; Was discharged on Surgeon’s Certificate of Disability07/30/1862atColumbus,MS. ADAH- Enlisted Private Company I, Date of death 05/16/1862. This soldiers name is from a list titled: Dead of the 1st Alabama Regiment atMadison Wisconsin. Martha L Riley, widow, Echo, Dale Co, AL. Pension application 01/1863 and09/07/1896. NARA- Prisoner of War atCampRandall,Madison,WI. CapturedIsland#10 04/07/1862, died05/15/1862. Enlisted-Alabama. Received04/20/1862. Captured Island#10: Register claims of deceased soldiers CSA presented by Martha L Riley (Louisa) widow filed01/30/1863, diedMadison,WI. NARA- Enlisted PrivateCompanyI. CapturedIsland #10 04/08/1862, Age 14. NARA- Enlisted Company D09/22/1862, Barnes Crossroads. Muster in roll dated01/16/1863, Montgomery, AL. Received $60 in full for my bounty. Amos Gilmore Chancey (1842-1924), husband of Winifred, daughter of Mary Ward, daughter of John Jr.
ADAH- Enlisted Private Company D 08/1862 at Ozark, AL. Paroled at Albany, GA, Born Henry Co, AL, Address in 1921- Newville, Rt 2 AL. Alabama Pension #11727 Dale Co. Discharged- 1865. NARA-Enlisted08/14/1862Barnes Crossroads. Hospital Muster Roll of Cannon Hospital atDalton,GAfor 07/31- 08/31/1863. Enlisted08/12/1862Echo, AL. Attached to hospital06/01/1863. Last paid07/31/1863. List, Prisoner of War- ParoledAlbany,GA05/24/1865. ADAH- Enlisted Private Company F, Coffee Co, AL. Branch:Calvary. NARA- Enlisted08/16/1862Barnes Crossroads. Died05/30/1863. Hospital: Tuscumbia,AL. ADAH- Enlisted 08/1862 Echo, AL. Paroled:Macon,GAat surrender. Discharged: 04/1865. Address 1907-1908 Hartford,AL. ADAH- Enlisted Private Company A 04/1861,Cusseta,AL, Born Troup Co, GA, Paroled atAppomatox,VA, Discharged 1865.Address- Midland City,AL. NARA- Parole Prisioners of War, Army NorthernVA, done at Appomatox Courthouse, VA 04/09/1865. Wounded, Battle Salem Church, VA05/03/1863: Promoted 2nd LT10/08/1862;GeneralHospital #4: Disease, Fistula, Admitted 06/16/1864. Returned to duty07/21/1864. NARA-Mustered into service,Lynchburg,VA06/11/1862. Bounty: $50. ADAH- Enlisted Company E Private 03/10/1863, Age 20,Montgomery,AL, BornSouth Carolina. Present at Chickamanga09/18/1863;Knoxvill 11/28/1863; Beaus Station12/18/1863; Drewerys Bluff05/09/1864;Richmond 05/12/1864; Drewerys Bluff05/16/1864; Trenches beforePetersburg. Appointed for Sergeant for gallantry on the field at Beaus Station12/04/1863.Abbeville, AL. ADAH- Enlisted Private, Age 22 04/30/1862 atLouisville. Hilliards Legion, Kolbs Battery; Also, Henry Co, AL Camp Watts, Nurse- medical service. Alabamapension, Jefferson Co, AL #14232. Also pension applicationDallasCo, 08/13/1915.Address- Selma,AL, Age 77. ADAH- Enlisted Private Company E02/04/1864, Age 37, Eufala, AL. Born-Georgia. Present at: Drewrys Bluff05/09/1864,Richmond05/12/1864, Drewerys Bluff05/16/1864, Trenches beforePetersburg,VA. NARA-Enlisted02/04/1864, Eufala, AL. Deserted the picket line before Petersburg,VA02/25/1865; Register of Prisoners Received and Disposed of by Provost Marshall General, Army of thePotomac02/24/1865toCenterpoint,VA 02/25/1865. Rebel Deserter, taken oath, transportation furnished to St. Andrews Bay, FL. Convalescent Division Hopsital, Howards Grove, Richmond, VA 04/20/1864. Returned to duty06/17/1864.GeneralHospital#9,Richmond,VA 06/04/1864. ADAH- Enlisted as a Lieutenant Company C. Pension application- Nellie Daughtry, widow, Dale Co, AL,08/11/1909. ADAH- Enlisted Private Company H08/27/1862,CampWatts, Farmer, Single. Present: Fredericksburg, Chancellorsville, Hanover Junction, Tottottopotomy, Cold Harbor, White Oak Swamp, Petersburg Enemy Left Flank, Gurley Farm W.R.R., Reams Station, Crater, Deep Bottom, Petersburg W.R.R., Petersburg Reams Station, Burgess Mill. Wounded atGettysburg07/02/1863, absent captureGettysburg07/16/1863, Bristow Station, Wilderness, Bradshaw Farm, Spottlysvania Courthouse. Residence- Dale Co, AL. Conscript. Exchanged 01/1864. Promoted to Corporal 07/1864. NARA- Wounded and left in hospital in Gettysburg07/02/1862. Promoted to 2nd Corporal 08/16/1864. PO Echo, Dale Co, AL. Captured 07/04/1862 and admitted to 12AC General Field Hospital, Army of Potomac, Gettysburg, PA. Diagnosis: Gunshot wound, left shoulder received at Gettysburg 07/02/1863, Transferred toGeneral Hospital 07/06/1863, then admitted 10/06/1863 to USA General Hospital, West Buildings, Baltimore, MD and paroled 11/12/1863. Admitted11/18/1863 to General Hospital Howards Grove,Richmond,VA with gunshot in left shoulder and furloughed 11/21 until exchanged. John Jackson Ward (1842-1890), son of Mary, daughter of John Jr.
ADAH- Enlisted Private Company E08/09/1862, Single, Farmer, Age 20, Camp Watts. Absent sick- Chancellorsville: Captured:Gettysburg07/02/1863; Absent Captured:Gettysburg07/16/1863through Burgess Mill (Petersburg)10/27/1864. Residence: Echo, AL. NARA- Prisoner of War- Ft Delaware, MD. Captured:Gettysburg07/02/1863. Received07/06/1863. Died:09/29/1863. NARA- Enlisted Private Company A10/10/1863,Montgomery, AL. Chimborazo Hospital #3,Richmond,VA.Admitted05/26/1864. Returned to duty 10/1864. Disease debility.GeneralHospital, Howards Grove,Richmond,VA.Received 10/18/1865. Prisoner of War:Point Lookout,MD.Date ofArrival- City Point, VA04/01/1865. Captured:Petersburg,VA04/01/1865. Released05/13/1865. ADAH- Enlisted Private 10/10/1864, Age 34, Henry Co, AL, Captain Graces Company. Exempt by reason of serofula. ADAH- Enlisted Private 10/10/1864, Age 16, Henry Co, AL, Captain Graces Company. Will be 17 11/13/1865. ADAH- Florida Confederate Pension Files,FloridaState Archives,Tallahassess, FL, File #D20423. ADAH- Enlisted Private 08/27/1864, Age 16, Covington Co, AL, Captain George W Kierce’s Company. ADAH- Enlisted Private Company K 03/1861, Florida- Orange Hill, Born- Dale Co, AL07/04/1838. Wounded- Chickamauga: Continued until surrender, was paroled atNewnan,GAand discharged from hospital 1865. NARA- Prisoner of War, captured by 17th Army Corp for the half month ending 11/20/1864, roll dated in the field Georgia 12/01/1864. FLORIDA PENSION APPLICATION- dated 06/29/1907. Enlisted Company K, 6th FL Regiment atVernon in Washington Co, FL- Captain A. McMillan, Regimental Commander at enlistment- Gen. Finlay at discharge- Gen. Bragg. Born in Dale Co, AL- 1939, Age 68 years, Citizen- State of Florida- 55 years. Shot through right forearm which stiffens the wrist joint. Occupation: Farmer. Resides in Washington Co, FL 10 miles south of Chipley, and 4 miles north of Chipley in Jackson Co, FL. Left command 2 months before close of war on account of being wounded 6 months. NARA- Enlisted Private Company F10/12/1863, Campbelton, FL. Sick in hospital inRichmondsince07/28/1864. AdmittedHowardsGroveHospital, Richmond,VA08/06/1864. Died of disease inRichmondHospital08/20/1864. Inventory of effects: Private ZC Ward08/20/1864- One jacket- $5, One shirt- $2, One pair of shoes- $5, One hat- $1.75. NARA-Enlisted Private Company E10/12/1864at Carryo Preston04/17/1865. Absent without leave. ADAH- Enlisted Private 08/01/1863, Age 35, Henry Co, AL. Discharge from disability, Henry Co 77 Reg. Beat 3. NARA- Residence- Henry Co, AL Reg 77 Beat 3. Enlisted08/01/1863. Discharged from Army for disability. ADAH- Enlisted Private Company G. Affidavits show he was on furlough wounded and never completely recovered. Pension application filed, Argie Tice, widow,Alabamapension #30750, Dale Co, AL. NARA-Enlisted Private Company K 08/01/1862at Macon, GA.Absent in hospital in Lynchburg 07/1863, absent detail in hospital at Augusta, GA 09/1863, absent wounded in hospital at Lynchburg, VA 05/1864. List of wounded 59th Georgia Regiment, list dated05/06/1865: wounded severely in knee at Wilderness,GeneralHospital,Petersburg,VA. Admitted01/22/1864: gunshot wound, left arm. ADAH- Enlisted Company K Private 06/01/1861,Lumpkin,GA.Wounded at 7 Days Fight atRichmond, Sharksburg,Chickamauga. Discharge date:04/09/1865. Alabamapension #11663, Dale Co, AL. NARA- WJ Dossett enlisted as a Private in said company07/17/1861. Present 12/31/1864. Prisoner of war records show him surrendered and paroled at Appotomatix Courthouse,VA04/09/1865. NARA-Enlisted as Corporal Company C. Captured by US forces under Brig. Gen. SB Brown and paroled atHartwell,GA05/18/1865. NARA-Enlisted as a Private Company A. Appears on a register of Floyd House and Ocmulgee Hospital Macon, GA on03/18/1864, listed as Colquitt Brigade,PO andState- Grubell,GA.Disease- fracture of ulna and lavation of radius, 60 day furlough. ADAH- Enlisted Private 1861, Abbeville, Henry Co, AL. Born08/18/1823- honorably discharged. Address- 1907,Ashford,AL. NARA-Enlisted 04/1862, Henry Co, AL. Bounty- $50. NARA-Enlisted as a Private Company C10/05/1861inGlennville,AL. NARA-Enlisted06/29/1864, Occupation- Farmer,Houston, State ofGeorgia, Age 38, to serve 3 years. NARA- Enlisted Company A 12/02/1864 Private, born in Dale Co, AL, Age 20 years, Farmer, Blue eyes, Light hair, Light complexion, 5’5” in height, mustered to 02/02/1865- New Orleans, LA. Bounty pay- $100, due- $200- to be credited cityAlbany. Deserted05/05/1865, Montgomery,ALfrom detailed service. NARA- Enlisted Company A 12/23/1864, Barrancas, FL, 43 years old, 5’7”, fair complexion, blue eyes, dark hair, born in Darlington District, SC, Occupation- Farmer. June- July 1864- Daily duty laying brick atGeneralHospital. Sept. 1864- Loss09/30/1864Barrancas- Died in regiment hospital. NARA- On June 29, 1864 Daniel enlisted at East Pass (Destin) Florida with the Union 1st Florida Calvary which was primarily composed of Confederate deserters from the Wiregrass area of southeast Alabama and was mustered into service at Fort Barrancas (Pensacola) Florida on August 3, 1864 and was assigned to Company F. He was listed with brown hair, brown eyes, fair complexion, 5’9” tall, and as a farmer from Henry County, Alabama, According to Daniel’s service record with the 1st Florida Clavary, “Company F” participated in an expedition to Pollard on December 13th-19th; Bluff Springs and Pollard on December 15; Escanabia Bridge December 15th-16th; and finally Pine Barren Ford on December 17th-18th 1864. In January and February of 1865, Daniel was listed as absent on detail with Lt. Joseph Sanders on Special Order #39 and was more than likely at the skirmish at Newton, Alabama which at the time was the county seat of Dale County. From February till June 1865 Daniel was listed as present but deserted from Barrancas on July 25, 1865 taking with him one pistol, one mcsaddle and equipment, and one sheltered tent. On November 17, 1865 he was not present when the 1st Florida Calvary was mustered out. Later, the charges of desertion were dropped on October 23. 1884 by the War Department and Daniel was restored full rights and later obtained a pension from theUnited States for his military service. Curtis Bagwell- After returning to Echo after the war Daniel was farming well and would split rails for someone to pick cotton for him. He complained frequently of his shoulder hurting and of heart disease and his back hurting him. Moses Riley- (Uncle)- Remembered his service with the Confederacy and remembered after several years at home “broke down” physically. William Smith- Was with Daniel in the 15th Alabama and the 1st Florida Calvary where they were bunkmates. Recalled Daniel complaining of gunshot wound pains, stiffness and soreness and saw him frequently since they were neighbors. Daniel and William grew up in the Echo community together. Thomas Woodham- (distantly related to Daniel by marriage) Went with Daniel to several log rollings. Terrell T Campbell, S.B. Bell, F.B. Cullens- All Echo physicians who had Daniel as a patient, Lorenzo Gill, Williams Barnes, Nathan Mims, James Barefield, Daniel Riley Sr. (Uncle), Wesley Riley, George Deal, James Riley, R.M. Daughtry, William Riley, and William Clarke, all from the little town ofEcho, all contributed or were witnesses for Daniel in his pension application. In the latter years of his life Daniel suffered with heart problems, back and shoulder pain, as well as other infirmities associated with getting older. Medical records acquired from the local Echo physicians revealed terrible shoulder, hip, and leg pain with substantial atrophy of his limbs. These conditions would cause one to surmise that the source of his physical problems probably began with the severe gunshot wound(s) received atGettysburg. Daniel died at home on December 23rd 1904 and was buried at the old Center Methodist Cemetery inHenryCounty with a host of his beloved kinfolks. JORDAN- William C Jordan, Private, Company B, 15th Alabama Regiment, Author of Some Events and Incidents During The Civil War. PRESTON- W.E. Preston (Mathews). Private Company B 33rd Alabama Regiment, author of Memories of the War of the Dale County Greys or Company B 33rd Alabama Regiment. Children of John Riley Sr. Please contact the Website administrator with comments or suggestions.